FOR SALE: A EMBOSSED 1950,S BARQ'S ROOT BEER FLANGE SIGN. It's big 22" X 14" .THIS SIGN IS STRAIGHT AND TRUE . 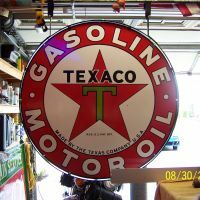 VERY CLEAN WITH A FEW SCRACTCHES AS SHOWN IN THE PICTURES.WOULD BE HARD TO FIND A NICER ONE.PRETTY RARE SIGN.FOUND ONE OTHER SOLD A FEW YEARS AGO ON EBAY RUSTY AND CRUSTY IT WAS.ADDITIONAL PICTURES AVAILABLE AND CAN EMAIL IF REQUESTED.EXCELLENT INVESTMENT PIECE.PRICE $700.00 + SHIPPING INSURED AND TRACKING.PAYPAL IF BUYER PAYS FEES.POSTAL MONEY ORDER PERSONAL CHECK PREFFERED.NO DISSAPPOINTMENTS ON THIS ONE. Willing to trade for Gas or oil sign !